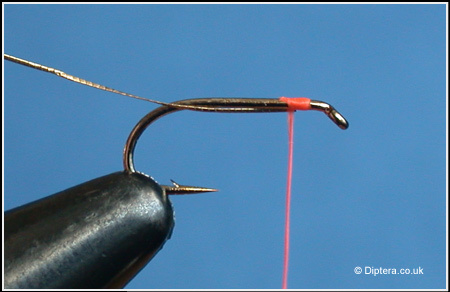 When tying in wire or tinsel, try and make sure that it is tied to the underneath of the hook shank. 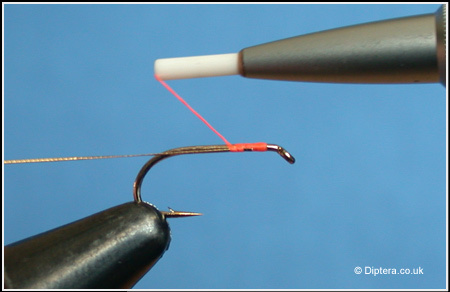 If you do this, then the first rib wind will start from the underneath of the fly. STEP 1 : Start the thread on the hook and let the bobbin hang free. Take a length of wire or tinsel and lay it underneath the hookshank with the end finishing just behind the hanging thread. (Not in front of the thread). STEP 2 : Take hold of the bobbin and wind it over catching the wire or tisel as it comes around. 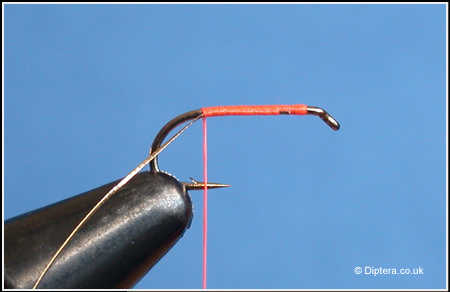 Continue winding to secure the wire or tinsel, making sure that it remains underneath the hookshank. STEP 3 : Continue winding the thread down the hookshank, catching in the wire or tinsel as you go. Check the position of the wire or tinsel after every few wraps, if its moved upwards then unwinf the thread and repeat. STEP 4 : This is what it should look like. A neat and uniform base for the body with the wire or tinsel in the underneath of the hook shank waiting for the rib to be wound.